Want to learn the best way to get your work done? Watch how professionals use best practices and professional skills. Professional SOLIDWORKS 2018 training tutorials for beginner and advanced users. Learn best practices and expert level skills while you watch all the steps. 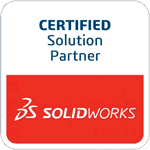 It’s the most thorough SOLIDWORKS Training Courses & Tutorials on the market. "I have previously completed a modeling course for SolidWorks but from a different company; having recently completed the first part and currently part way through the TEDCF course for Inventor 2015, I was of the opinion that the TEDCF courses were by far superior to the course I had previously completed for SolidWorks, therefore I purchased the SolidWorks course from TEDCF. As expected, I have found the course to be much better defined and more in-depth than my previous course although I was surprised that more coverage of the configuration for the menus is not included in the first part as I did find configuring and positioning of the toolbars helpful from the previous course I completed, having said this I am sure it will be covered in the next Advanced Parts section and as I have also stated I am not in anyway disappointed in this course and would definitely recommend this course to anyone wanting to learn SolidWorks." We work hard to assure our customers get the best, and it shows. Read reviews from our customers. How do we know what to teach? Our sister company is a product development company. TEDCF stands for The Engineering Department Consulting Firm. So we use both SolidWorks and Autodesk Inventor professionally and we know what you need to know to produce professional models, assemblies, drawings, and renderings. When you finish the course, you will too. We also know that your productivity is important. After all, that what 3D CAD is all about, increased productivity and throughput. So our courses show you how to meet this goal. We use 3D CAD is to save time, money, and increase productivity. Doesn’t it make sense to learn a workflow based on productivity? Without a strong understanding of sound procedures your productivity and projects can end in disaster. Quite often users who don’t have these skills need to restart their projects several times before they get close to being right. So it’s easy to lose time, money, and productivity. Now what? By striking at heart of this problem we show you how to increase your productivity. You’ll start with the basics and build a firm foundation of advanced skills designed to help maximize your productivity and the quality of your work. You’ll learn how the commands work and how to use them effectively, saving time and money. We know that you’ll be satisfied with our courses, so we give you the opportunity to return them. If you’re not satisfied within 30 days of purchase we’ll give you your money back. Why wait? Get yours today. Professional Modeling says it all. This course shows you how to create professionally sound SolidWorks models. You’ll learn practical ways of working with SolidWorks. Even though this is the first course in the series it quickly takes you to an advanced level. These advanced concepts are used in subsequent courses. So both beginners and advanced users should start with this course. Learn advanced ways of creating SolidWorks 2018 models and assemblies. It’s easy to learn and powerful to use. You will discover the real use of custom configurations, using equations to create features, and advanced mates. The list is too long to mention here, but by the end of this course you will be glad you watch it. Make your mechanical drawings come alive. One of the most important tasks is to setup your drawing templates to streamline your work. You will learn how to do this plus so much more. You’ll create custom layers, title blocks, and borders to give your drawings a professional look. Master sheet metal modeling while you learn to excel in design. You will experience the professional way of creating fully functional assemblies. You will produce structurally sound sheet metal models. Learn best practices, and find the secret to getting the job done in the shortest time possible. Finite Element Analysis (FEA) is easier to learn than you might think. You don’t need to know how mathematical matrices work. You just need to know how to use the SolidWorks FEA module. We show you how to do this with confidence in the results.